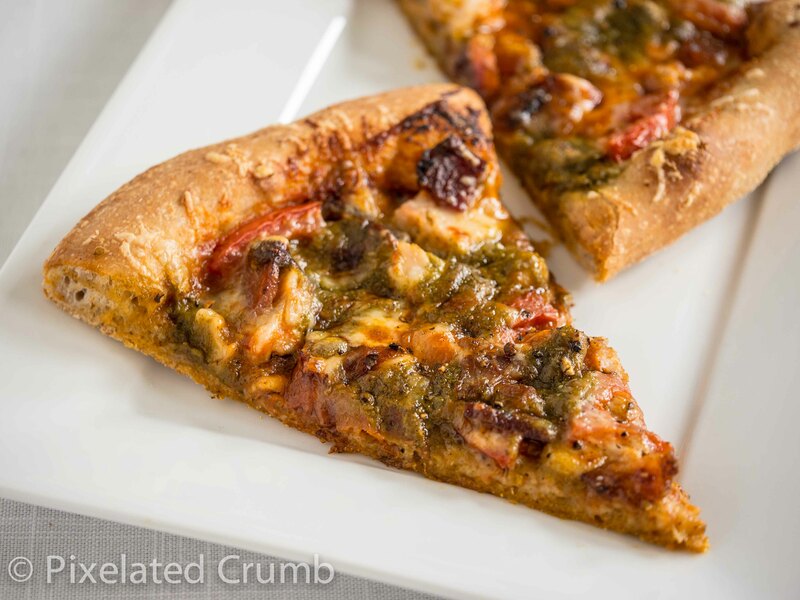 Packed with tomatoes, bacon, chicken, cashews, tomato sauce and pesto, this pizza was bursting with soul-satisfying flavor. I never would have thought to put nuts of any kind on pizza, but I was completely sold. They add a nice crunch and the nuttiness plays perfectly off of the other ingredients. 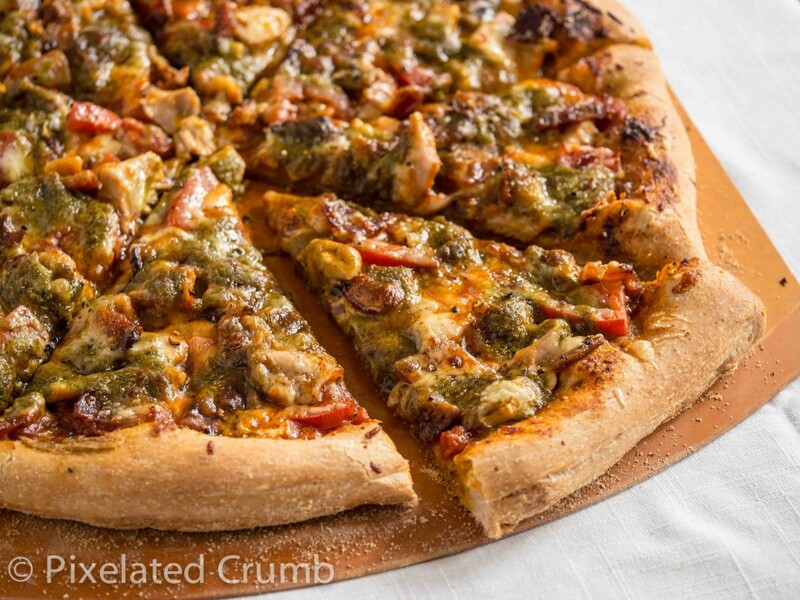 I generally prefer pizzas with tomato sauce, but I also really love pesto, so I am completely on board with a pizza boasting both. And who can complain about bacon on pizza? It’s got to be the most innovative and satisfying pizza I’ve ever had, so when Joseph suggested that we make our own version at home, there was no need to twist my arm. It’s now our favorite pizza that we make. We made it for my sister and brother-in-law when they visited last fall and they said our version was even better than Avalanche’s. Now, they may just have been tired and hungry from traveling, or perhaps just buttering us up hoping for a larger slice of chocolate cake for dessert, but I’ll take a complement when I get one. Whether or not it’s better than Avalanche’s is irrelevant. All I know is that it is one amazing pizza and while we don’t make it that often, it is guaranteed to make me very, very happy. We make a one pound recipe of pizza dough in our bread machine subbing in some King Arthur Flour Pizza Flavor. If you're curious about our pizza gear, we absolutely love our Mario Batali cast iron pizza "stone." It has handles which makes it easy to take it out of the oven even when it's blazing hot, and we never have to worry about it breaking or cracking. We've been using it pretty much weekly since we got it nearly 5 years ago and have never had a problem. For the pizza peel, we use the Epicurean Pizza Peel, which allows us to easily slide the pizza into and out of the oven, and then we can cut the pizza right on the peel. It can be a little daunting at first to slide an uncooked pizza into a hot oven, but with a little practice and a whole lot of cornmeal (seriously, I really coat the peel with cornmeal), it becomes second nature. Preheat oven to 500 degrees Fahrenheit and place pizza stone, if using, on the top rack position of the oven. We like to preheat the pizza stone for half an hour. If using a pizza stone, liberally spread cornmeal over pizza peel before placing dough on. Brush oil over pizza dough, spreading all the way to the very edge of the crust. 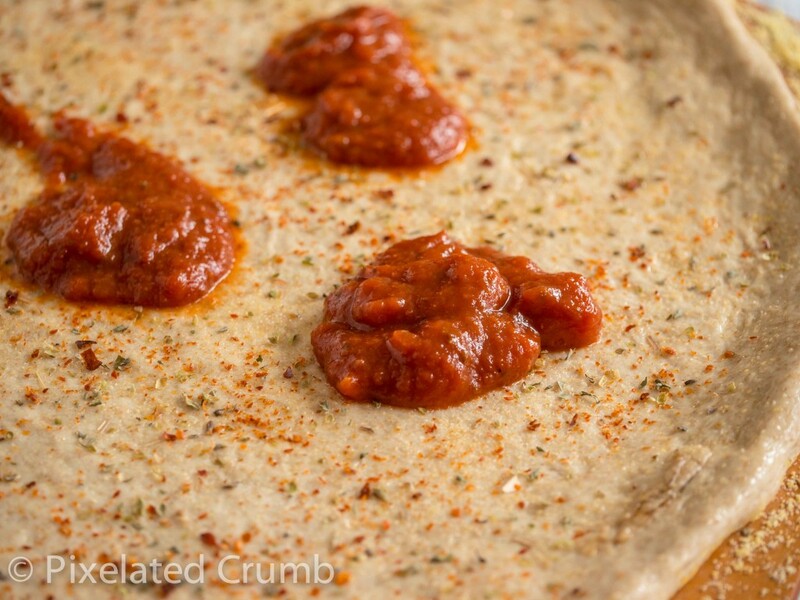 Sprinkle garlic powder, oregano, and chili flakes over dough. 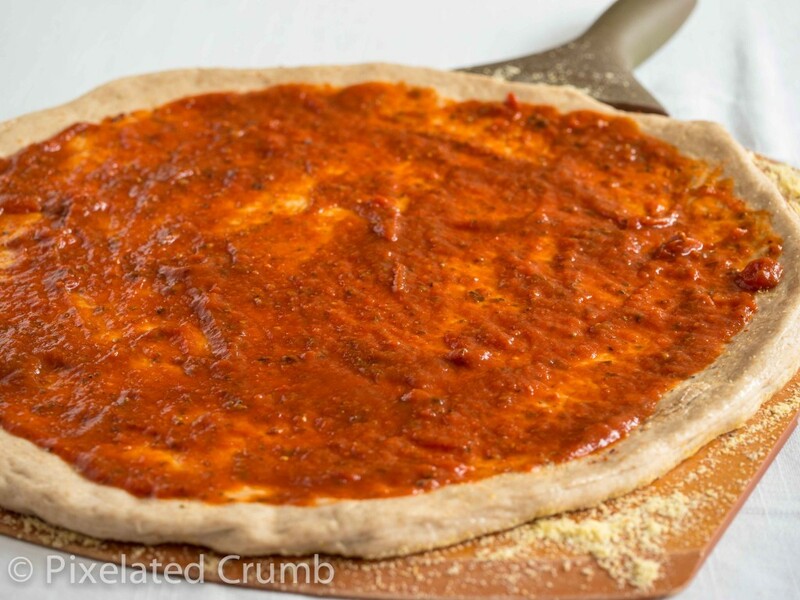 Spread tomato sauce to about an inch from the edge of the dough. 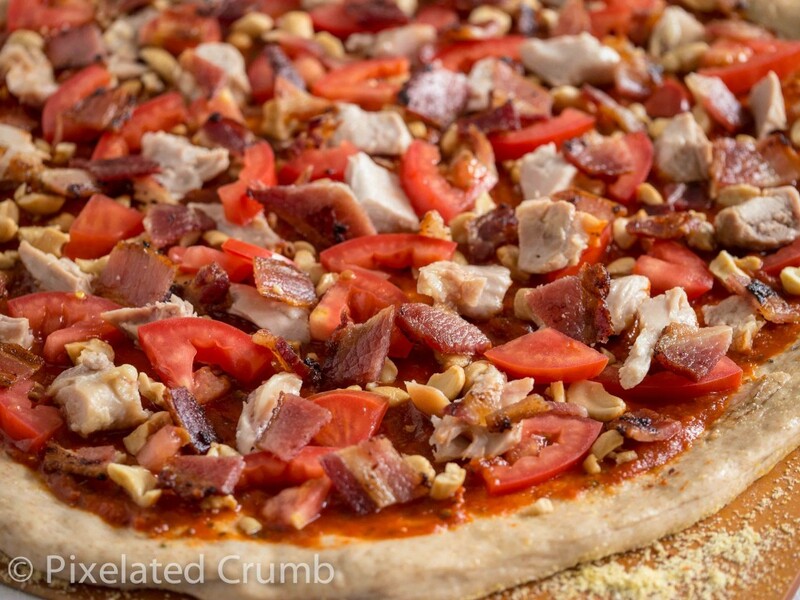 Spread tomato slices, bacon, chicken and cashews over the pizza. Drop teaspoons of pesto all over the pizza. Sprinkle the three cheeses over the top. Slide pizza onto preheated pizza stone, if using (otherwise put pan with pizza onto top rack). Cook for 9-11 minutes, until crust is dark golden brown and cheese is melted and slighted browned in some spots. If using a pizza stone, remove the pizza stone with the pizza on it and let it sit for a full minute before removing to allow the crust to further crisp up. 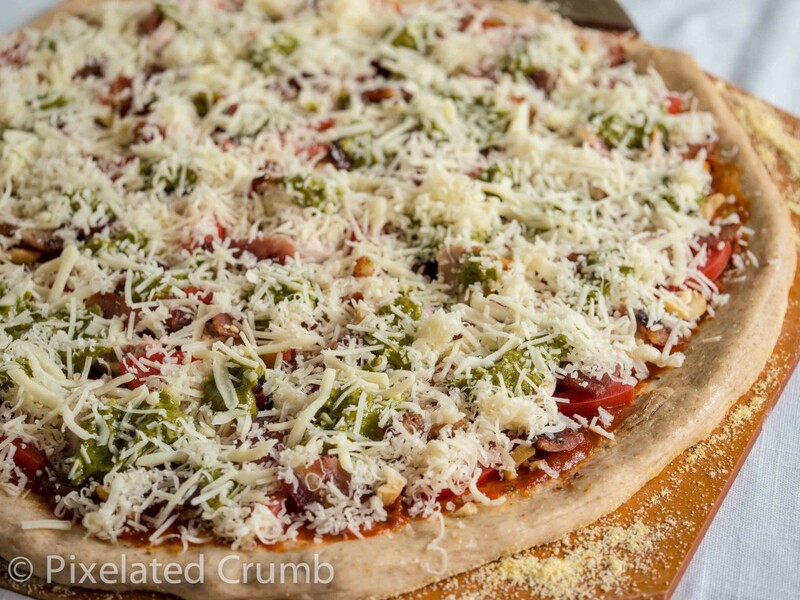 Allow pizza to sit for at least a minute or two before slicing up and devouring. This entry was posted on Tuesday, March 25th, 2014 at 11:20 pmand is filed under . You can follow any responses to this entry through the RSS 2.0 feed. You can leave a response, or trackback from your own site. This pizza really is INCREDIBLE. I like pesto on anything, and the combination of flavors (and textures) here sounds delicious!